We are loving our new golf cart speaker. 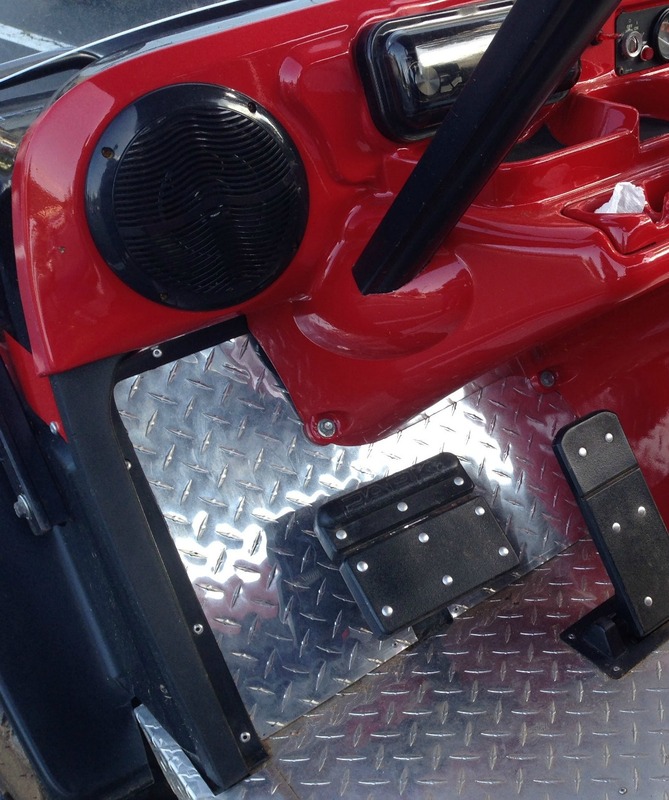 Thanks to bluetooth wireless technology, you too can enjoy your favorite music or radio station in the golf cart without having to install or hook up speakers. I have been thinking about installing a radio and speakers which meant I also had to install a 12 volt converter reducer. 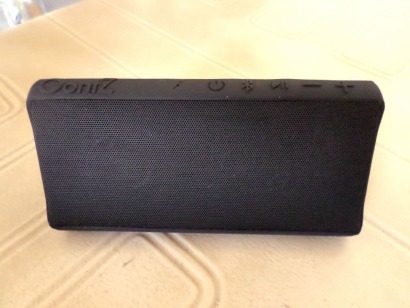 But if you just want to listen to music or the radio from your smart phone, iPod or Kindle all you need is a bluetooth speaker. This waterproof blue tooth portable speaker has a rechargeable battery that can last up to 10 hours with full, high definition, clear sound. An advantage to this speaker is that it has a built-in mic for hands free speaker phone which makes it convenient to pick up a call when it's connected to your smartphone. The rubber shell and interior design gives it a rugged look and also means it is splash and shock proof. 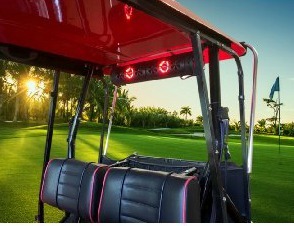 We place ours in the golf cart cup holder and take it with us on the golf cart, to the pool and to the beach. Install marine grade speakers so you'll have sound with you wherever you go no matter what the weather. Often they come as a set with a receiver, radio and waterproof speakers. With blue tooth capability you can listen to any choice of music. 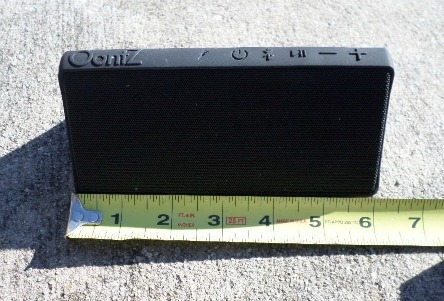 We saw this OontZ Angle Plus demonstrated at the PGA Golf Expo and were really impressed with the high quality sound, the size and the volume. The outside has a silicone protective coating. It boasts an IPX5 waterproof certified rating and the company states it is weather proof and water or splash resistant. So a little water won't hurt it - but don't drop it in the pool. As you can see it is small and is only 6" long. Set it in your dash to use on your golf cart or take it with you to the beach, the pool, or your backyard. It pairs with your iPhone, iPod, iPad, Android, Kindle or any other electronic device that has blue tooth capability. You don't need to keep buying and replacing batteries. The rechargeable lithium ion battery can be recharged by using the included USB cable connecting it to your computer or to an electrical socket with an adapter plug - the adapter plug does not come with it. The light blinks red as its charging. Then stays on solid when it is fully charged. It takes a couple of hours to fully charge. A full charge provides about 15 hours of play time. A built in microphone allows for one to use a speaker phone hands free. It works very well and provides clear voice on both sides. The speaker has its own volume control and track selection buttons. To save battery power it will automatically turn off if you forget to. A very well constructed speaker, with quality sound, you may decide like we did to skip the radio and installed speakers and go for this great portable speaker. Use the smart Bluetooth remote to control your phone's function or simply connect your music player to the remote's built in AUX input. This waterproof 8 speaker system has 4 marine grade speakers, 2 end loaded marine grade woofers and 2 front firing tweeters. It can connect to any phone , tablet or MP3. 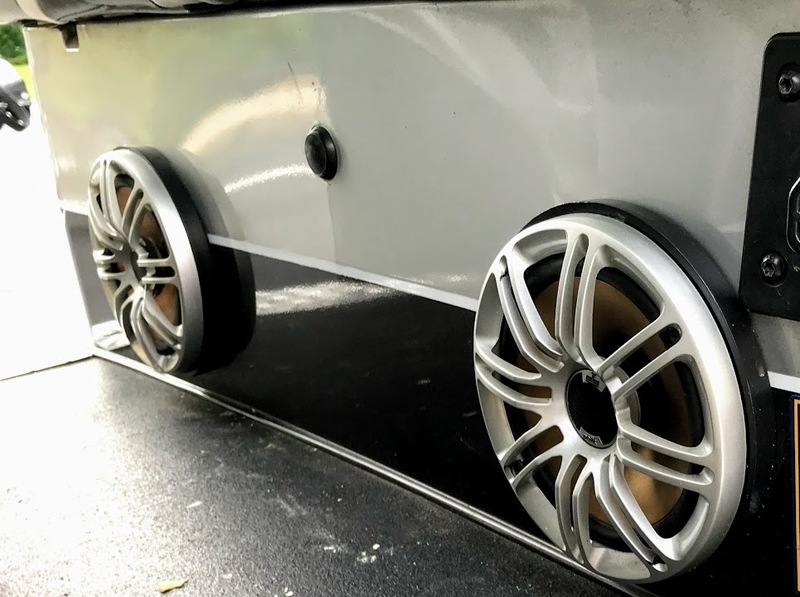 Not only does this system provide amazing sound, but it has an integrated illumination system of lights with flash patterns and different speeds and colors. 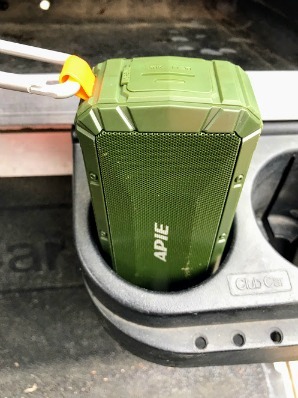 Wrap these speaker, even better for stereo sound, wrap one speaker on either side of your golf cart because these little guys have great sound and can be paired. Once you complete the pairing, your device will do it automatically. Don't worry if it starts to rain, because these little guys are waterproof. Great sound and volume for their size. 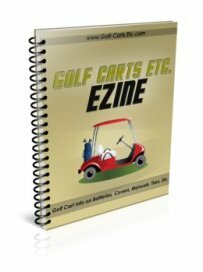 They can easily be removed and attached - so use them on your own golf cart or on the club's golf cart. This weather and splash resistant portable speaker can be used in your golf cart or car cup holder. It also has a built in mike to use as a speaker phone. The controls are easy to get to since they are right on the top of the speaker. The rechargeable battery lasts 8.5 hours on a full charge. Of course what's most important is the sound - very impressive. 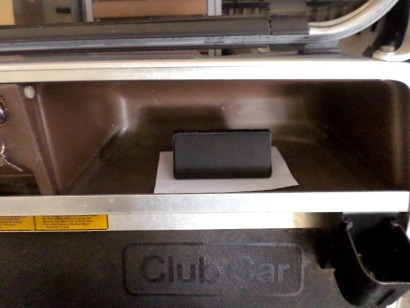 Forget about installing a radio or speakers and simplify with a blue tooth golf cart speaker. If you are going to listen to music or the radio, you have to play from a blue tooth device like a cell phone, iPod or other MP3 player. 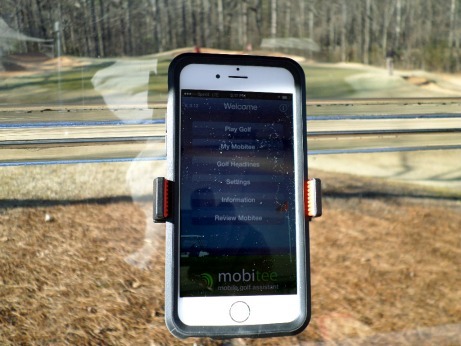 An easy way to keep it safe and secure is with this universal cell phone mount that attaches to any windshield. It has a really strong suction seal that latches on to the surface thanks to a locking mechanism on the back which keeps it from moving or falling off.